Brands failing to listen effectively to Voice of the Customer, Eptica research finds | Eptica - Multi Channel Customer Interaction Software. Email Management. Web Self-service. Live Chat and Agent Knowledgebase. Reading, UK, 7 November 2018. While over three quarters (78%) of brands now measure customer satisfaction, most admit to failing to get real business insight from listening to the Voice of the Customer (VoC). That’s according to new research conducted for Eptica, which found that less than a quarter (24%) of brands feel that existing measurements such as NPS, CSAT and CES give them the deep insight they need to transform their business, and the experience they provide to customers. The research found that despite brands analysing the growing number of interactions they have with their customers, they struggle to get real value from them. For example, 83% analyse email conversations, and 75% study customer reviews and comments, yet only 12% and 11% respectively see this currently providing actionable customer intelligence. Existing VoC systems are unable to measure factors that directly impact loyalty, revenue, churn or to share insight across the business. 62% of survey respondents wanted to identify pain points through VoC programmes, while over half were looking to measure emotions. The same number (53%) needed to be able to identify detractors and explain why they acted as they did in order to protect revenues and minimise churn. Customer insight data is still stored in silos – while 79% shared information with marketing, 82% with customer service, 74% with sales and 71% with operations, just 38% shared with e-commerce and 21% with teams running physical shops. 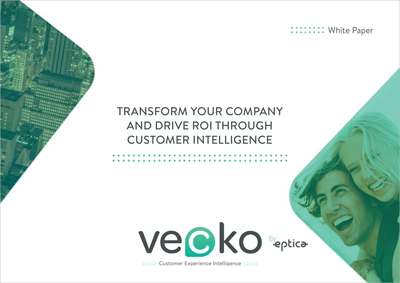 To meet this growing need for next generation VoC systems, Eptica today launched vecko, an AI-powered solution that enables brands to access customer intelligence, continuously improve CX and generate immediate ROI. vecko delivers real-time, actionable insights across the business, automatically analysing customer conversations across every digital channel (including email, social media, chat and speech to text), as well as indirect feedback, such as mentions on Twitter and Facebook, and survey feedback. The only solution to successfully analyse emotions, vecko is built on Eptica’s 17 year + experience in delivering multilingual customer service and customer experience solutions built on its own, specially trained artificial intelligence, Natural Language Processing, Text Analytics and machine learning technology. vecko has been created to democratise feedback, meaning it shares intelligence with all departments through intuitive, role-based dashboards. This breaks down silos, provides a holistic view of what customers really think, and enables brands to make better business decisions and generate fast ROI. “Current metrics and systems provide a rough guide to what customers are saying, but don’t give insight into why they are behaving in particular ways or deliver a true, real-time picture of their emotions,” added Taoufik Massoussi, Product Manager and Head of AI, Eptica. “By extending analysis to all customer conversations, vecko provides access to a gold mine of potential insight, delivering actionable customer intelligence across the organisation through its advanced, AI-powered innovation. To measure the current state of the VoC market, Eptica worked with Engage Business Media to survey a range of UK businesses in Q4 2018, with 154 respondents from organisations of all sizes. An infographic on the research is available here and the full report here.